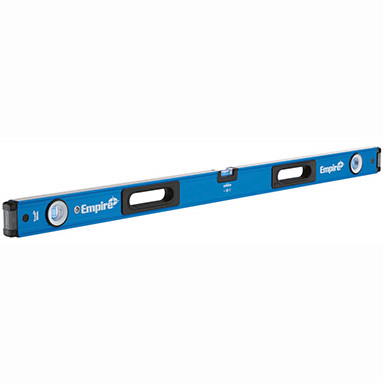 Empire True Blue Level - e75 Series Box Level - 2.4m / 96in. 2.4m (2400mm) / 96 inch (8ft) spirit level. All position accuracy: .0005"/in, .029° on both working edges. Reinforced vial locking system secures acrylic block vials and delivers long life accuracy. Tool-free removable, shock-absorbing endcaps provide superior protection and scribing performance. Precision milled edges for guaranteed accuracy. 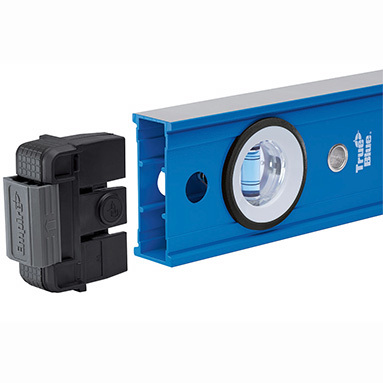 Surface grippers prevent the level from sliding on flat or angled surfaces. Ergonomic grip zones enhance comfort and portability. High contrast e-BAND vials highlight the edge of the bubble. 300° viewing window maximises range of view. Hang hole for ease of storage. Empire True Blue vials - made in the USA.